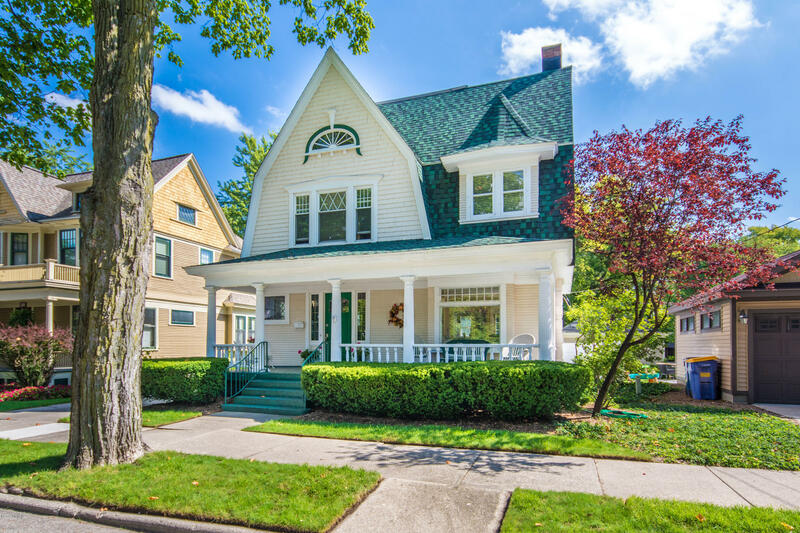 This classic Victorian era home built in 1900 has been perfectly preserved throughout w/extraordinary restoration that combines both the original charm & tasteful modern style functions yet keeping w/the original architectural design. Come sit on your front porch & enjoy the convenient location & tree-lined street in welcoming neighborhood with walking distance to pubs, restaurants & Farmers Market. You'll love the new roof (3 yrs. ), new furnace & A/C (1 yr.), & new hot water heater (only 1 weekold), original moldings, refinished hardwood floors, pocket doors, private Master Suite, & finished 3rd floor with endless options & separate heating zone. Impeccably restored with beautiful landscaping, this is truly one of the most admired homes in Eastown! The data relating to real estate for sale on this website comes in part from the Broker Reciprocity Program of MichRIC, LLC. Real estate listings held by brokerage firms other than Crown Ridge Properties are marked with the BR logo and detailed information about them includes the name of the listing broker. Listing broker has attempted to offer accurate data, but buyers are advised to confirm all items. Information last updated on 2019-04-20.